How are conditions of today's ever-changing societies expressed, represented and imagined through moving images? 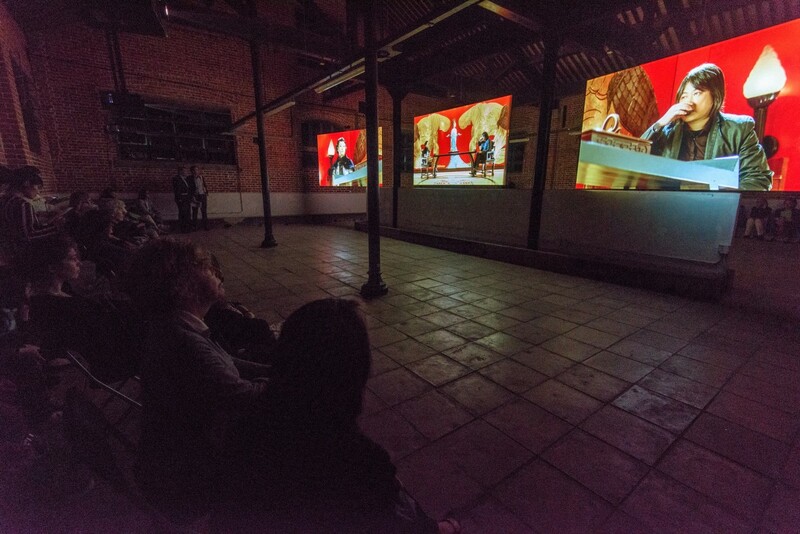 Inspired by the themes of migration and the rise of diasporic cinema internationally, Mobile M+: Moving Images uses Hong Kong's 'migratory cinema' from the 1980s and 1990s, and in particular Clara Law's 1996 feature film Floating Life, as a starting point to reflect upon the mediated realities of the migrant experience. This multi-site project is made up of a thematic screening programme and a two-part exhibition. While the ongoing screenings focus mostly on works of a filmic note, the exhibition of Mobile M+: Moving Imagestakes on an expansive view to explore the broader experience of how ideas about borders, movement, mobility, transformation and transition are communicated through different visual languages and forms of image production. Movement and mobility, whether physical or otherwise, are also inherently embedded within our perception and experience of migration. Thus, the term 'moving' was central to how this exhibition came together. Besides being a pertinent turn of phrase, moving image, with its fluid, time-based and constantly evolving nature, is quite possibly the most ideal medium to disseminate, comprehend, visualise and (re)present such transient experiences. Featuring a diverse range of works by twenty-four Hong Kong and international artists, filmmakers and collectives, from single-channel videos to installations, animations and photography, amongst others, this exhibition also includes selections from the museum's growing collection. In presenting the works included in Mobile M+: Moving Images, we hope to deepen understanding of what it means to be mobile, and also of what it means to hope and dream for a better life elsewhere. In many ways, Floating Life was a construction of a specific kind of migrant experience - one that is steeped in the narrative of Hong Kong's pre-1997 wave of emigration. Yet through it and the other works offered here, we must concede that the world through which we navigate today, almost twenty years after Floating Life was made, has become even more transitional, and thus even more complex. Mobile M+: Moving Images is curated by Yung Ma and includes works by CAMP, Paul Chan, Chen Chieh-jen, David Diao, Estudio Teddy Cruz, Simryn Gill, Dominique Gonzalez-Foerster, Isaac Julien, Kan Xuan, William Kentridge, Hassan Khan, Firenze Lai, Li Ran, Charles Lim, Anson Mak, Ellen Pau, Koki Tanaka, Wang Gongxin, Apichatpong Weerasethakul and Chai Siris,Wong Ping, Young-Hae Chang Heavy Industries, Yuan Goang-Ming, Zhang Peili and Zhu Jia.